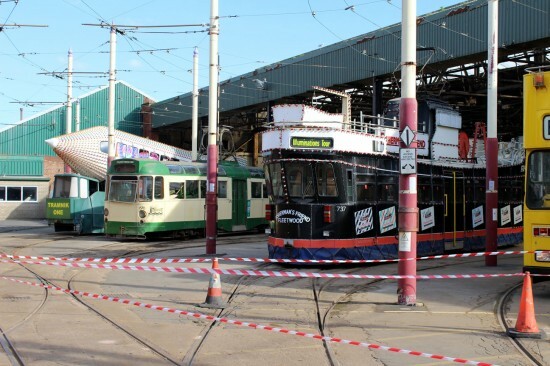 The weekend of 26th and 27th September saw the eyes of tram enthusiasts looking towards Blackpool with the most ambitious period of heritage operations planned since the upgrade of the tramway to help celebrate the 130th anniversary of the tramway. 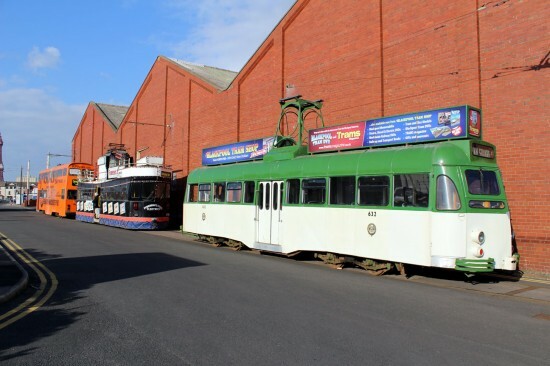 Over the course of the weekend 21 different heritage trams carried passengers (including two members of the “B” fleet) whilst both Rigby Road and Starr Gate Depots opened their doors to a lucky few giving a rare chance to see behind the scenes. The weekend also saw the return to service of Twin Car 675+685 (see separate story here) and Balloon 723 with out of service trams lined up both on Blundell Street and on the fan at Rigby Road. Both days of the weekend saw an intensive tram service run with the bulk of journeys running between Pleasure Beach and Little Bispham although hourly services also ran from Starr Gate to Fleetwood along with some other short-hop trips. On Saturday 26th September 12 trams ran in service with the first northbound journey in the hands of reactivated Balloon 723 which left depot shortly before 0945. The departure of 723 confirmed that this was the scruffy surprise announced in the build-up to the event with its expired all over advertising vinyls for Sands Venue having now been removed leaving the 1980s Green and Cream livery which had remained underneath. Despite the vinyls having been removed this coat of paint remained in fairly good condition and although it wasn’t in the usual condition you expect of a tram in the heritage fleet it was a pleasing addition for the weekend. Although 723 was to run the first passenger trip north of the day it wasn’t actually the first tram to leave the depot with Pleasure Beach loop having already become the place to be. This included Twin Car 675+685 which was also making a return to service following a repaint into the Half Green and Half Cream livery with orange pantograph tower. Set 5 was officially launched back into service at Pleasure Beach leaving with a journey through to Pleasure Beach at 1100 with a full load of passengers taking the opportunity to get on board for the first time since 2011. Other trams to run on the heritage service during the day were Bolton 66, Boat 227, Twin Car 272+T2, Boat 600, Centenary 642, Centenary 648, Railcoach 680, Open Top Balloon 706, Balloon 715 and Frigate 736. The two Centenary Cars were used on the full length Starr Gate to Fleetwood services throughout the day with the other trams being mainly kept to the Pleasure Beach to Little Bispham section (with some shorter journeys as well). In addition Balloon 719 was stabled on the loop line at North Pier where it was used as a shop selling 130th Anniversary goods whilst fellow Modified Balloon 711 was running the depot shuttle between Rigby Road and Starr Gate via Foxhall. Onto Sunday 27th September and 13 trams were used on the main heritage service with the two stars of the previous day again being used: Twin Car 675+685 and Balloon 723. They were joined by Boat 227 (an extra tram not advertised previously), Twin Car 272+T2, Centenary 642 and Centenary 648 – as per the previous day – with weekend debuts for Box 40, Standard 147, Boat 230, Brush 631, Balloon 701, Balloon 717 and the Western Train 733+734 completing the numbers. Again a similar pattern developed as per the first day of the weekend with Set 5 running a 1100 departure from Pleasure Beach to Fleetwood whilst Centenary 648 was once again running on the Starr Gate to Fleetwood circuit. Unlike the previous day, however, the second tram to operate the full length journeys was Twin Car 272+T2 with Centenary 642 used from Pleasure Beach instead. The depot shuttle was in the hands of Modified Balloon 700 with 719 again at North Pier selling more Blackpool 130 memorabilia. Another of the highlights of the weekend was the chance to see behind the scenes at both the depots. Starting off at Rigby Road tour participants were taken on guided tours around the depot with the first port of call being the Electrical Compound where, on the first day, Boat 230 was waiting for photos. 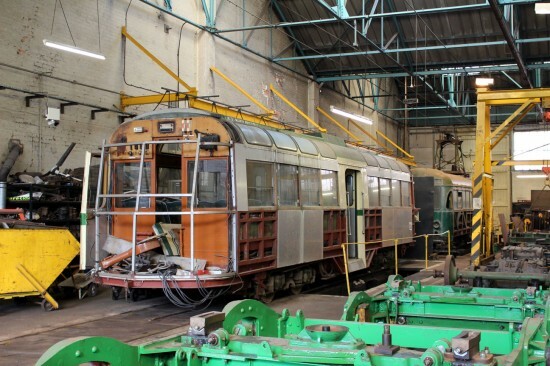 It was then onto the Paint Shop where OMO 8 had been put on display, the Body Shop where Standard 143 could be found and finally the Fitting Shop where two projects for the long-term were: Works Brush 259 and Railcoach 279. Tour participants were then able to board the depot shuttle which ran from Hopton Road to Foxhall where it used the crossover to head down to Starr Gate Depot. A trip was then made through the Tram Wash (once it had been checked that there were no windows open!). Another guided tour followed around the clean, spacious and light modern depot and on the first day this saw 001 and 007 in the maintenance section of the depot and 014 in the main running shed. Both days also saw different tram line-ups taking place on both the Rigby Road Depot Fan and on Blundell Street. Saturday 26th September saw the three remaining Coronation Cars displayed on the depot fan at Rigby Road – the first time in several decades that all three had been shown together – whilst the Blundell Road line-up saw the Fleetwood Heritage Leisure Trust’s Jubilee 761 along with Trawler 737 and Brush 632. This was followed on Sunday 27th September by Rocket 732, Trawler 737 and Twin Car 676+686 on the depot fan and Modified Balloons 720, 709 and 707 on the Blundell Street. Although it is rare to see all six of these trams out in the open nowadays the rarest of all was the Twin Set which had last run in service during 2004 and has barely been seen outside since. Although not part of the Blackpool 130 weekend of events mention should also be made of the Illumination Tours which took place on both evenings. One of the effects of the withdrawal of the Trawler for 2015 is that more “trams of interest” see use and that is exactly what happened over this weekend. Saturday 26th September saw Twin Car 675+685 make its debut on tour duty as one of five trams to be used. It was joined by the Illuminated duo of the Western Train and the Frigate and Balloon Cars 701 and 717 with all five trams running two tours a piece on what was a busy night in Blackpool. The highlight of the following evening was the use of Boat 230 (running two tours) with Western Train 733+734 and Balloon Cars 717 and 715 also running tours. Unfortunately there was a large gap in the arrival of trams at Pleasure Beach to start tours which saw a large queue develop around the loop. In addition to these trams the Frigate was also out being used on a Private Hire. The Blackpool 130 events weekend was always going to be the most ambitious heritage tram operation since the upgrade but on the whole it seemed to be a huge success with the warm and sunny weather adding to the whole spectacle. There may have been some things which possibly didn’t quite go according to plan but in an event as ambitious as this that was always likely and it didn’t detract from what was going on elsewhere. * A full Photographic review of the Blackpool 130 events – including the two days leading up to the weekend – will follow on British Trams Online on Thursday 1st October. And if its photos you are looking for why not take a look at our Facebook page where there are numerous images taken during our LIVE coverage. The two returnee trams over the weekend are seen together at Pleasure Beach on 26th September. Twin Car 675+685 and Balloon 723. Inside the Fitting Shop Railcoach 279 and Works Brush 259 are seen. Both trams had been moved in here for display purposes only and are both described as long-term projects. The Saturday line-up on Blundell Street consisted of Brush 632, Trawler 737 and Jubilee 761. This entry was posted in Blackpool Tramway, Event Reviews. Bookmark the permalink. Brilliant weekend in Blackpool. Such a great variety of trams on offer and so many great photo opportunities to be had! Loved it! Thanks for an amazing celebration of Blackpool’s finest! An outstanding weekend! Well done to all those involved in organising the event, with special praise to Bryan without whom, I am sure, none of this would have happened. After 2011, how many people would have thought that so many traditional trams would ever again be seen out on the tracks at any one time? This was a truly fantastic weekend, for me possibly the most enjoyable tram event I’ve seen in 30 years as an enthusiast. It was great seeing so many heritage trams in use, bringing back memories of my first visits to Blackpool in the 1980s. The huge variety and intensive service of heritage cars, the depot tours and line-ups at Rigby Road and Pleasure Beach and the bus tours all combined to make it special. I think we in the enthusiast community owe a huge debt to Bryan and everybody else involved for making this such a success. 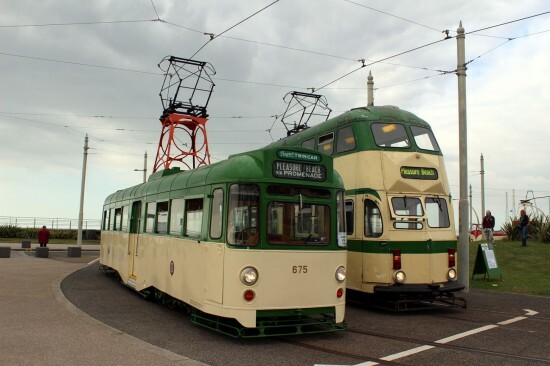 I for one would love it if Blackpool could run an annual ‘enthusiasts’ day’ with perhaps a ‘platinum’ level of heritage service (as many trams as possible in service). I don’t remember if this has been reported on BTO before, but it was stated at the depot tour that 706 is now to be retired, and that the hope is restore open-balcony Standard 143 to service as a partial replacement. What a triumph this event was! Well done Blackpool Transport, we had a fantastic time. Had a brilliant time all weekend and a great write up and photos. Thanks to all involved. Nice idea of Jim’s to have an enthusiasts day. Couldn’t get a ticket for the depot tours so am sorry to hear about 706 being retired. Presumably it won’t be until Standard 143 is restored? I didn’t see any evidence of the flexity service being delayed by the heritage cars. On returning from Fleetwood on Twin set 5 late afternoon we did pass 6 flexitys heading north before we reached Bispham so of course this led to a long wait if you were heading south. Just sheer numbers of people getting on and off on the busiest Saturday of the year. At my guest house they said they were full for the first time this year. Graham – From what the depot tour guide said, I thought he meant 706 is being withdrawn (not forever, one hopes!) at the end of this season. It’s possible I misunderstood. Although 143 looks like it needs a lot of work, they seemed confident of getting it finished in the near future. Yes that is my understanding as well. Alice will be withdrawn at the end of this season and subject to budget 143 will be finished over the winter to enter service in 2016. The car on depot shuttles on Sunday 27th was 700. Thanks to everyone at blackpool for a brilliant day. Great weekend well done Blackpool Transport it was like the old times again and big thanks to the staff never known them been so friendly let’s hope this becomes a annual event. Monumental effort which could only have been achieved through the sheer dedication of the growing voluntary team. These events represent a unique opportunity for tramway to help people once again fall in love with this truely unique asset and look to the future as well as the past. The progressive management team members leading from the front and volunteering should be commended. Cant thank the volunteers enough don’t think some will ever fully appreciate just how much they achieved and continue to achieve this year. I just hope “130″ helps once and for all silence the minority which still exists both outside and within Blackpool Transport who fail to recognise the value of heritage. The number of days volunteers have given up this year travelling often great distances and at great expense to develop operation incredible.Defining moment for the entire preservation scene. Was fantastic to be part of on the Operations side. Sadly I did see a few photographers who thought they owned Blackpool and was mildly amused when I was being coughed at and ‘Excuse me’ when I was walking to and from Trams! Great to see that they didn’t seem to spoil it for anyone. the most wonderful thing to see was the amount of ordinary visitors enjoying the Trams – though one did ask me why there was a yellow bus in the line up!!! I agree with John unfortunately there is a minority of tram enthusiasts who have appalling manners and think they have the given right to exclusively photograph the trams and mainly vent their feelings on the general public which at times causes conflict. It’s not only photographers of trams it is also true for a minority of people taking pictures of railways, buses, planes and everything else. Recently I was “asked” to move because I was standing in front of a bus. What they didn’t know was I was helping out and taking pictures on behalf of the organisers, who approached the photographer and said any more bad language and they would contact the police. They also asked him to leave the site. I believe patience is a virtue – wait and you end up getting the picture you wanted anyway. About the Flexity’s. On Saturday around 3pm two incidents conspired to cause the problem with the tram service. Firstly a tram at Starr Gate had a problem which caused the brakes to stick in the on position for around 30 minutes. I saw around 6 trams heading to Starr Gate but nothing returning for over 35 minutes. Then I heard there was an stabbing at North Pier which caused a serious blockage for trams coming from Fleetwood. The area around Pleasure Beach became tramless for a while apart from the trams on the turning circle. Rightly or wrongly I view 706 almost as a mascot for the fleet as on a warm sunny day nothing, but nothing beats travelling along the front in the open air, and the only thing that beats a boat car is a decker with a sun trap on top. Now if one of the other balloons without a secure future were to be made available so that in time we had two “Alices” you really would be talking! Let’s not forget that there has been suggestion in the past of 704 being restored to open top condition as a possible long-term project. Judging by the amount of people who love 706 I wonder whether BTS/BHT/FTS should consider an appeal to fund its major overhaul? erm there aren’t any available! I’d love to see 31 back but Beamish has a much greater need for it! Now 704 restored to original condition alongside706, which is a class in its own right in my humble opinion would be great to see. I may be wrong but I suspect Paul was thinking of another older open top car which is currently disused…. in the short term these things may be unlikely, but long term, who knows? In Blackpool always expect the unexpected! 59 should be in Blackpool and running. Many people say many things about its condition, but it looked rather sorry for itself when I last saw it! When it is restored I hope that the correct interior is reinstated rather than the non standard Standard! I would think the underframe is more of a concern as some framing was replaced in 1960/77 and certainly most of the upper deck, stairs etc were new in 1960. Boats are still more popular as if there isn’t anyone upstairs it isn’t immediately obvious that 706 is an open topper! Indeed, Blackpool Transport deserve great credit for putting on such a good show for the 130th anniversary. My only complaint is that, on the Saturday, when I was there, the only trams operating to and from Fleetwood were those dreadful Centenary cars, which force all passengers to travel whilst looking towards the centre exit of the car! I would much have preferred a Balloon or a twin-set! Twin set 5 went to Fleetwood twice on Saturday. The purpose of running the Centenaries was to run the Trams which were SG to FWD performers and recreate that era, which whilst not everyones cup of tea were certainly very popular. Don’t worry though, I’m sure there will be many more chances to ride to Fleetwood! A big well done to the Heritage team for running to Starr Gate as well! celebration’s. Heads up for information how to get tickets for depot tours and a big thank you to all involved, and made it special for our the early start from Larbert (0538 to Edinburgh). I wonder if anybody has a list of the trams that could be seen at Rigby Road depot on Saturday during the tour.